Posted February 10, 2007 in 2 Fox, 2007/02, Featured Work, Periods, Topic, z Archive. I was pleasantly surprised by a gift I received not too long ago from my niece. It was a calendar with a pulp art theme. 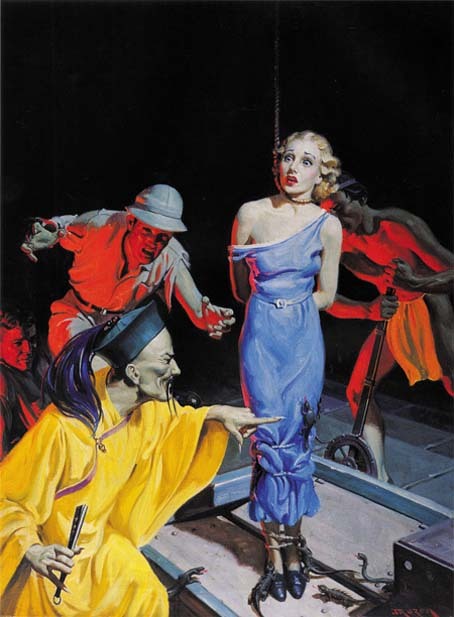 I had never mentioned to her any interest in pulp art. In fact it is area of Americana that I have not dealt with very much. Anyway the calendar had some great art and was much appreciated. Then while in a book store I spotted “Pulp Art” by Robert Lesser. Well I really have too many books and even with its great price I was reluctant to buy it. That was until I spotted the painting from The Mysterious Wu Fang (see image below). Then I could not resist it, after all now I could consider the book as part of my Simon and Kirby research. Now there is are four years between these two publications. Did Joe pick up a copy at a used book store or had he kept a copy from when it first came out? Who can say, but there is little doubt that Joe liked the image. But there was also an unexpected link. 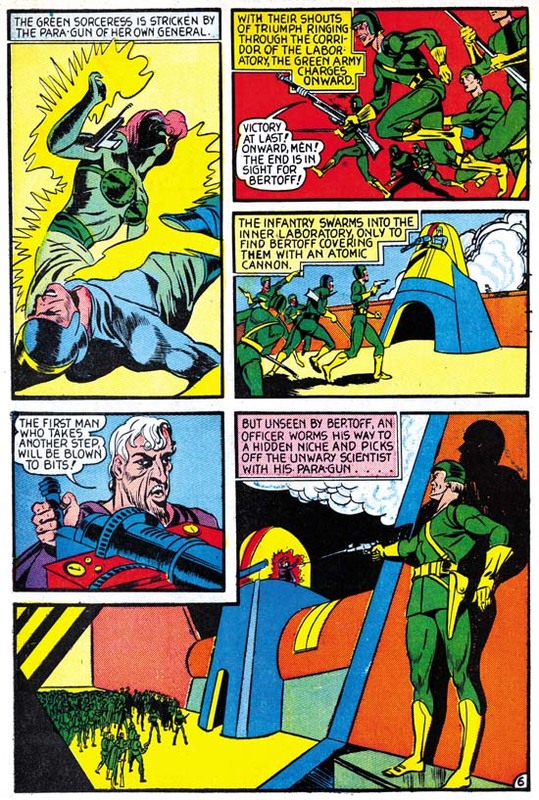 When I looked at caption to the illustration of this painting in Lesser’s book it said the original was from the Steranko collection. Seems like Jim and Joe have similar tastes. Posted December 29, 2006 in 2 Fox, 2006/12, Early Jack Kirby, Periods, Serial Posts, z Archive. 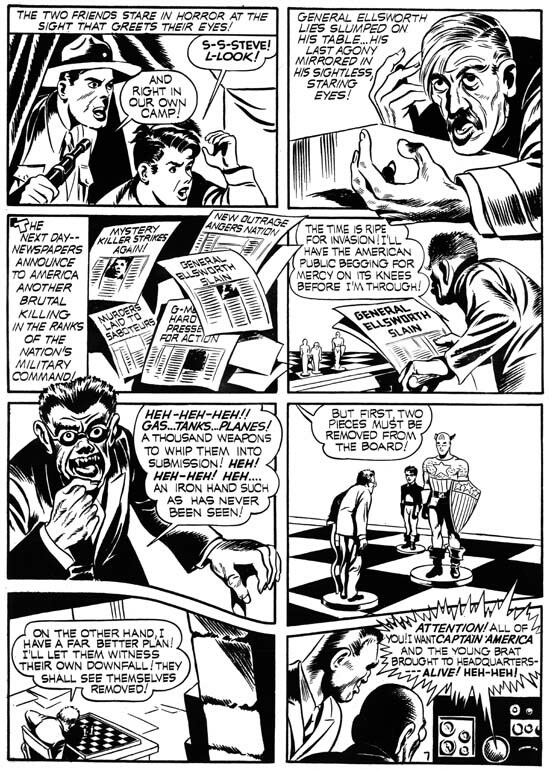 Jack Kirby met Joe Simon when the latter became art editor for Fox Comics. 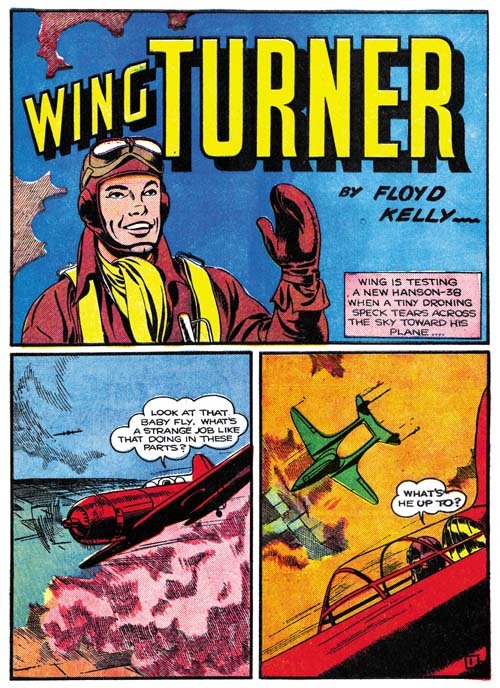 I find it interesting that Jack started doing actual comic book work (as opposed to syndication strips) at the same time as Joe’s first cover for Fox (May 1940). 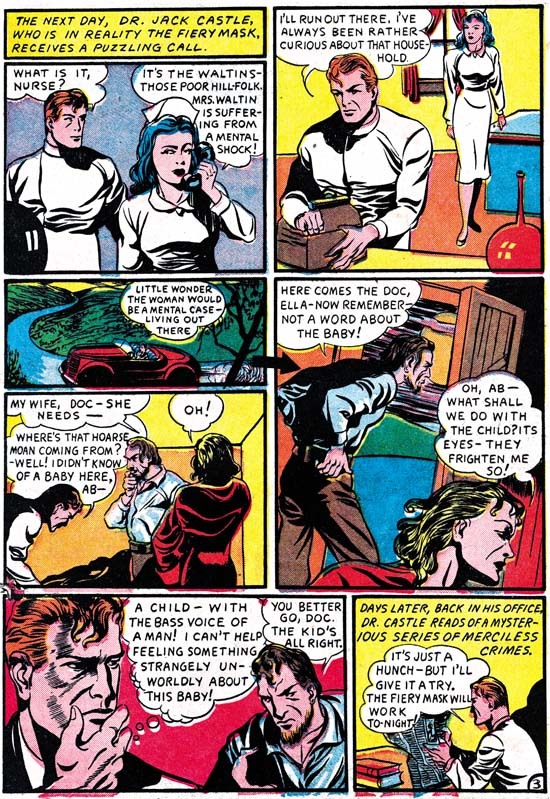 Perhaps it is just coincidence or perhaps Joe gave Jack some Fox features and may even had help Jack get work outside Fox (Crash Comics, see previous chapter). In any case it is clear that Joe quickly recognized Jack’s talent. 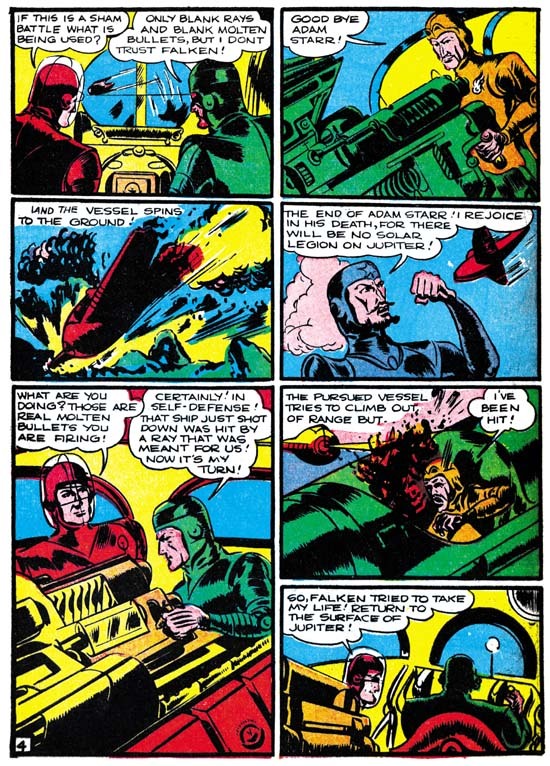 Previously Joe had submitted a feature called Blue Bolt to Funnies Incorporated, a shop run by Lloyd Jaquet. 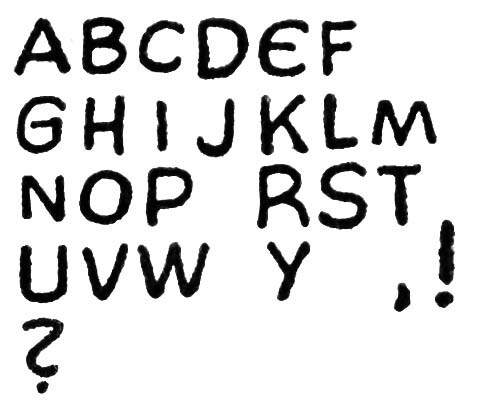 Initially it was not used but later became the basis for a new comic title. 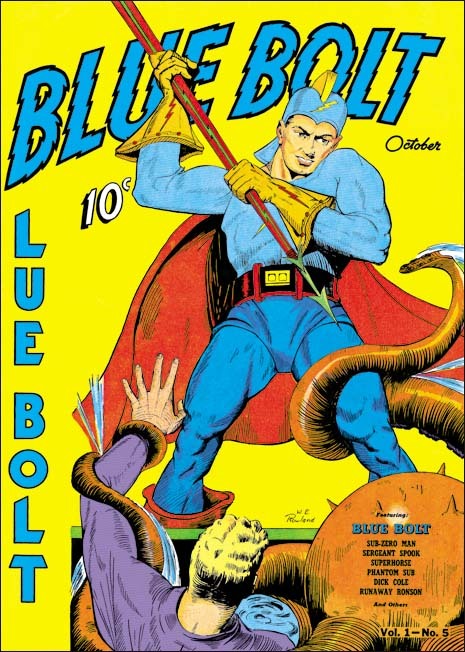 Blue Bolt #1 came out with a cover date of June 1940. 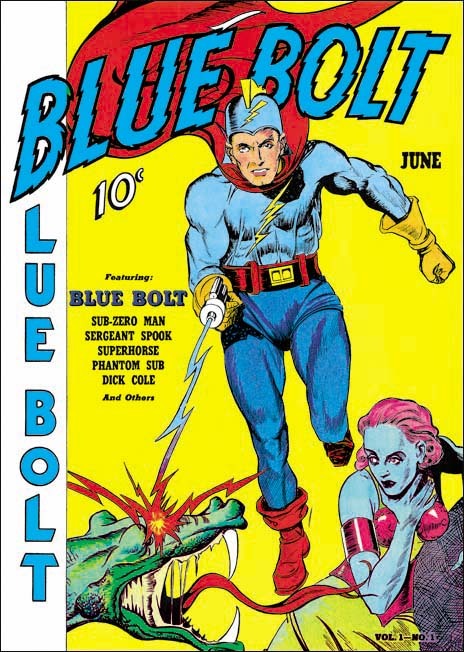 Joe did all the art for the first Blue Bolt story since it actually was done prior to his starting work at Fox. 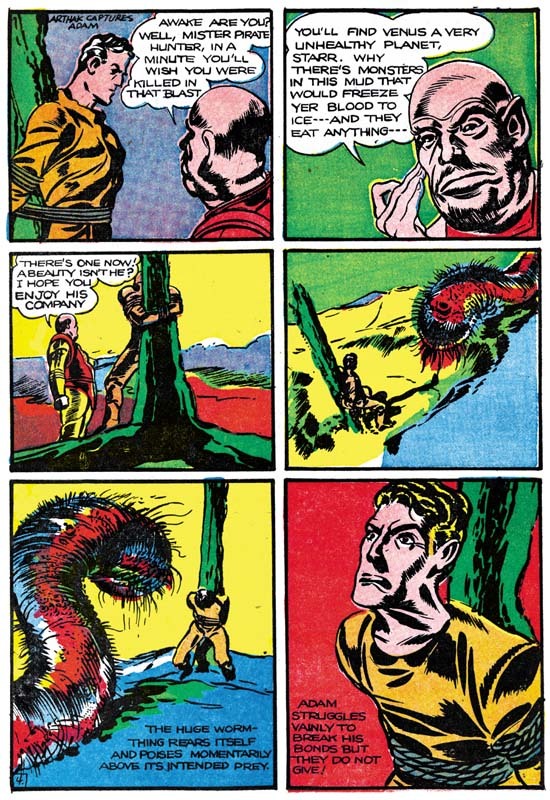 But for new issues of the comic, Joe got Jack to give him a hand. The feature in issues #2 and #3 are signed by just Joe Simon. 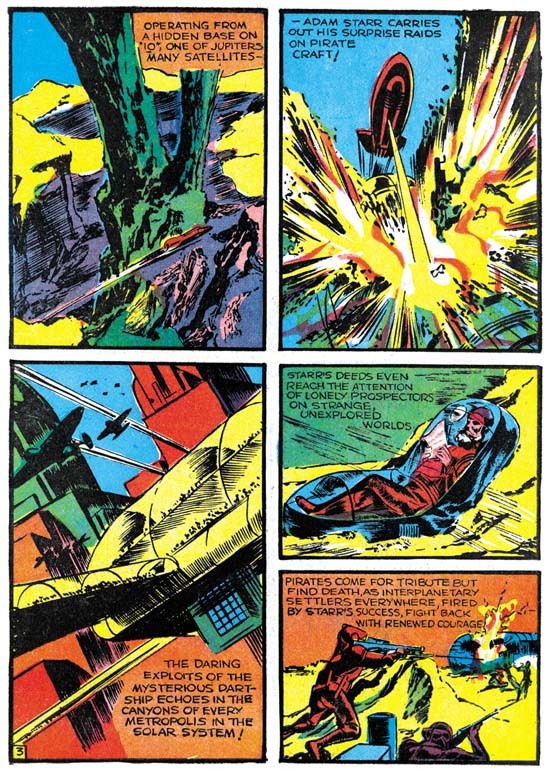 However the art was done by both Joe and Jack, working on different pages. Jacks contribution for these issues was rather limited. For BB #2 Jack did pages 1 (except for the splash), 2, 4 and 5 while Joe did the rest of the 10 page story. For BB #3 Jack would do pages 1, 2 and 7. He may also have done page 5 but I am not sure of that. By issue #4 Jack was doing all the penciling as he would do for all the remaining issues. 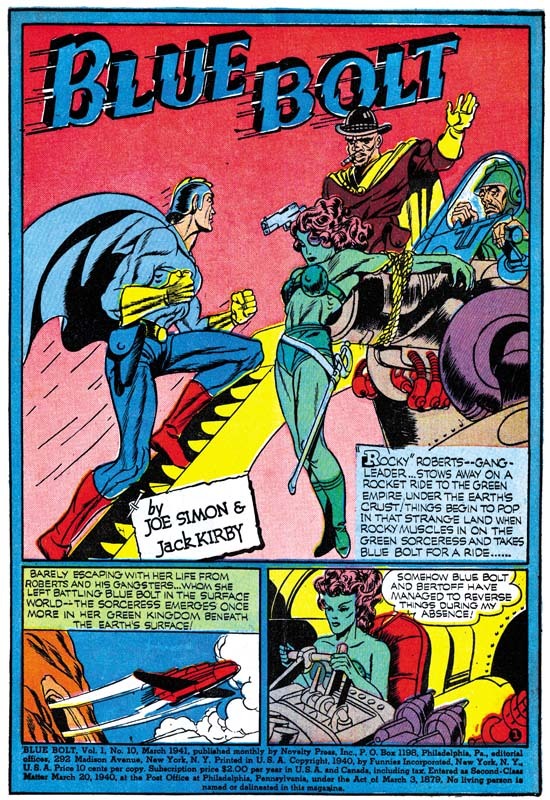 With issue #5 for the first time we find credits as “Joe Simon and Jack Kirby”. It is only fair that Joe’s name comes first, after all he created the feature. Although Joe and Jack were now working together, I think it would be a mistake to consider them at this stage as equals. Simon was art editor at Fox and after that would have the same title at Timely. 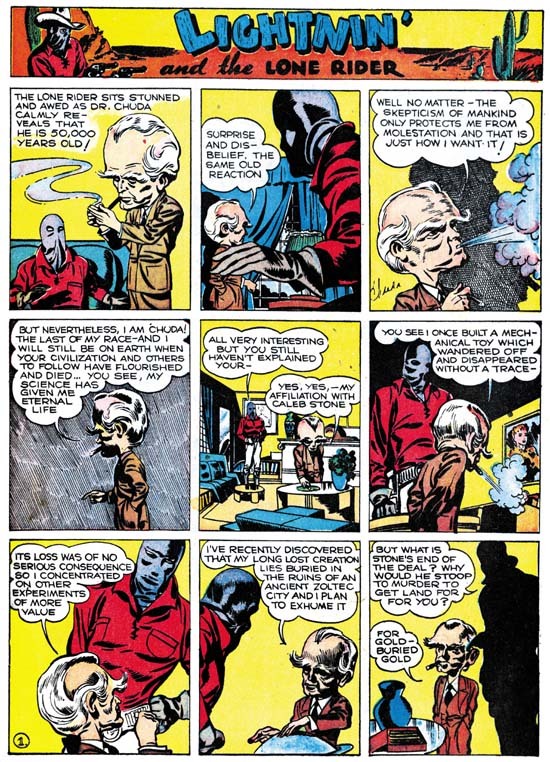 People were starting to recognize Kirby’s talent but Jack had yet to have a hit. 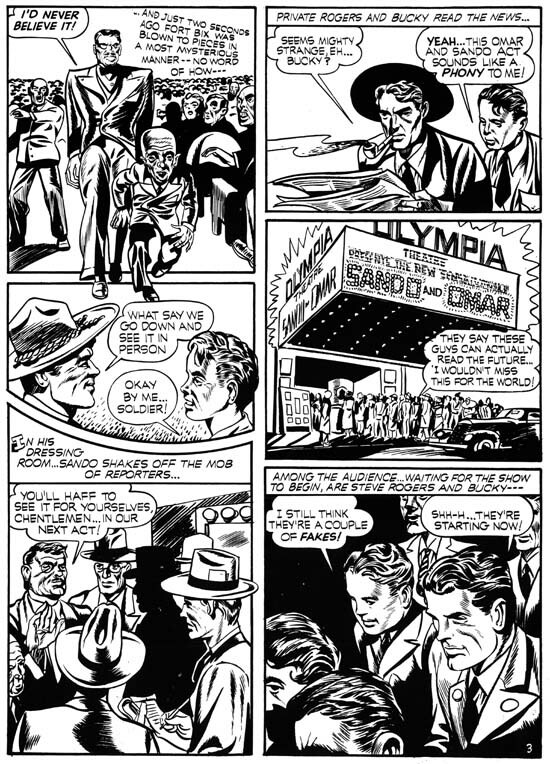 In any case once established, Simon and Kirby would be the credit order for the rest of their time together. One surprising thing about the Blue Bolt title was how few of the covers were done by Joe or Jack. 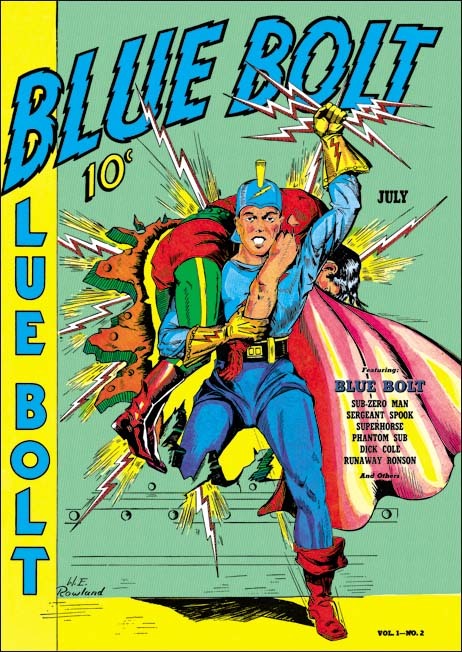 Joe alone did the cover for Blue Bolt #3. 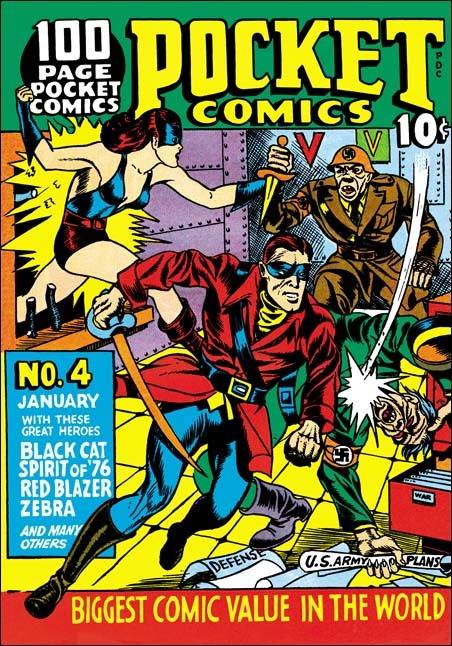 The cover for BB #7 was a joint Simon and Kirby effort. 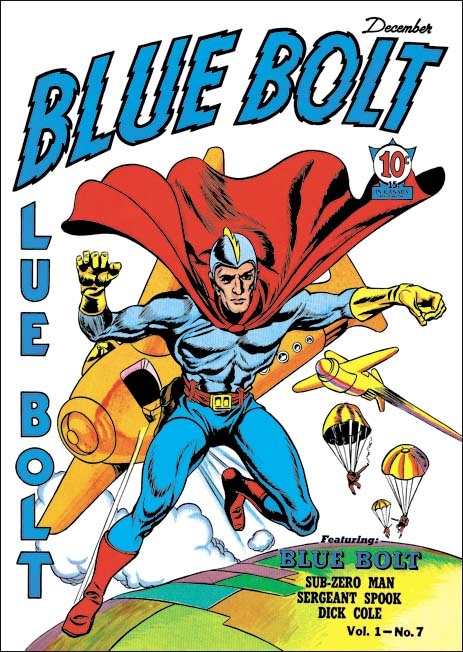 The figure of the Blue Bolt was clearly done by Jack. 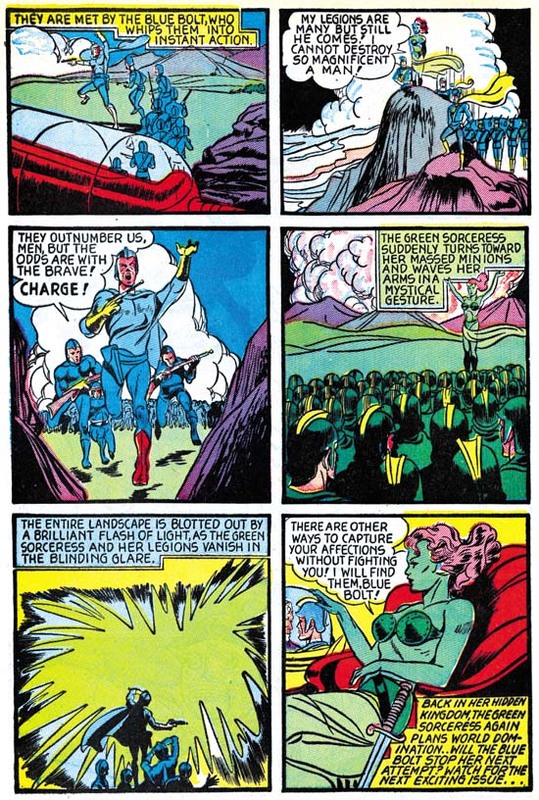 But the flying ships and the earth do not look like Kirby’s work. 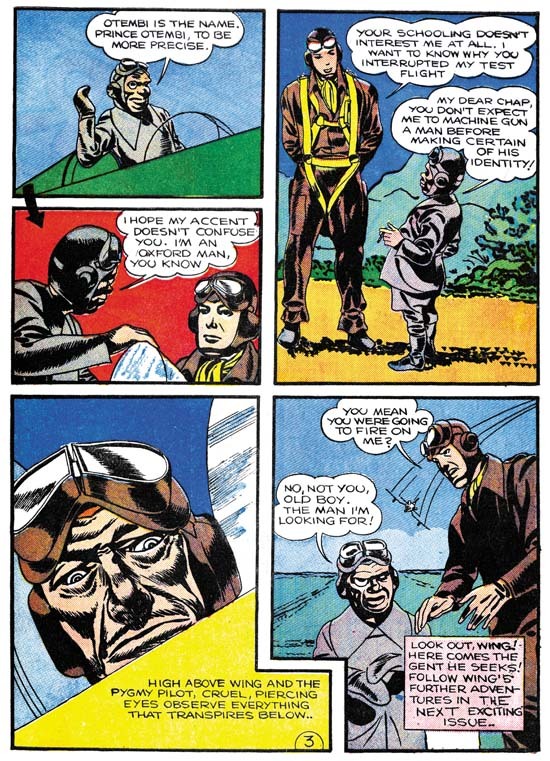 Similar blimp-like ships (without the wings) can be found on Simon’s pages from Blue Bolt #2. So I believe Joe is responsible for the background art on this cover. 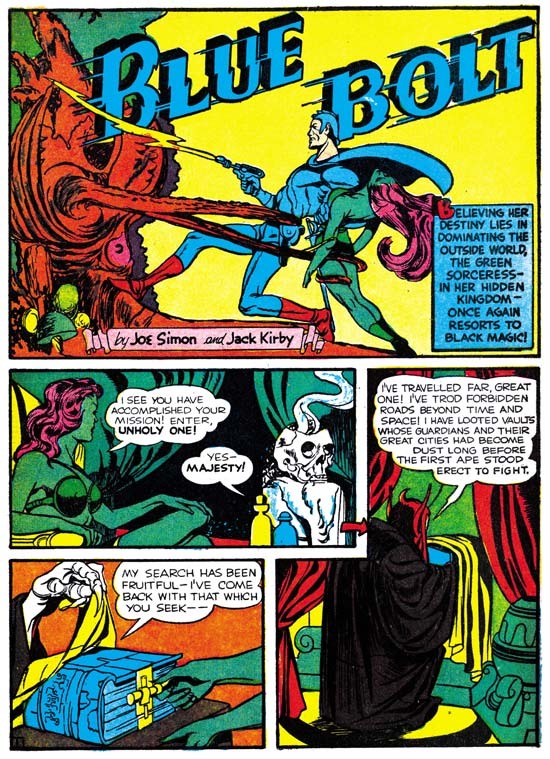 Blue Bolt was a monthly so it provides excellant examples of Kirby’s art as it rapidly improves. 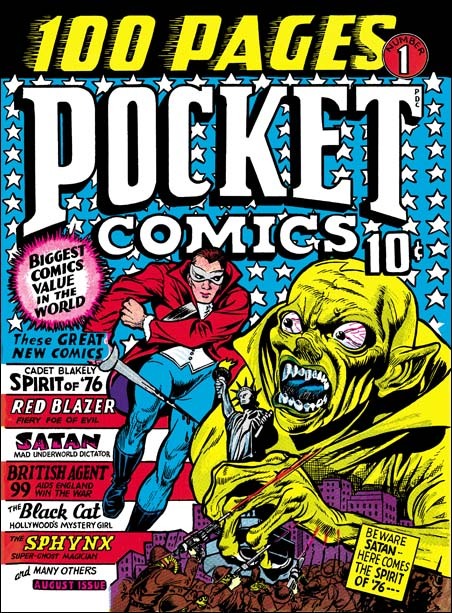 It is fortunate that issues #2 to #10 have been reprinted by Verotik Publishing. The book is out of print but can be found on eBay from time to time at a resonable price. 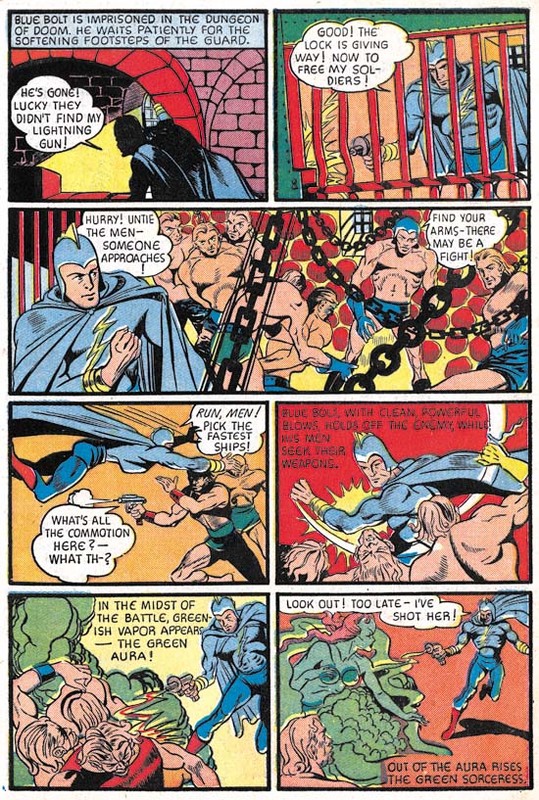 Early in the series Kirby’s fight scenes were as awkward as it was in the Blue Beetle syndication. 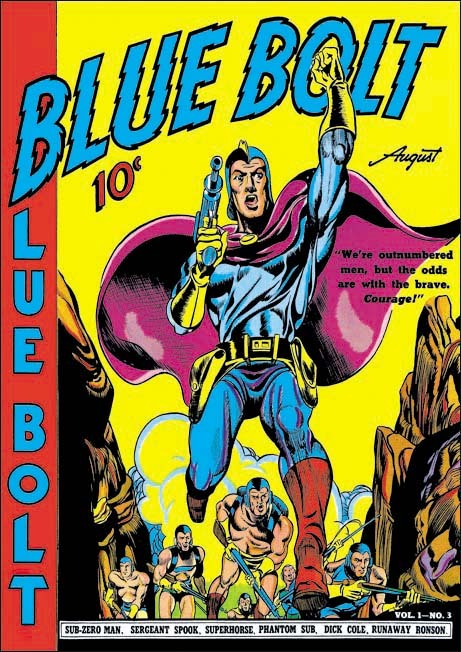 But by Blue Bolt #10 Jack was providing exciting action. 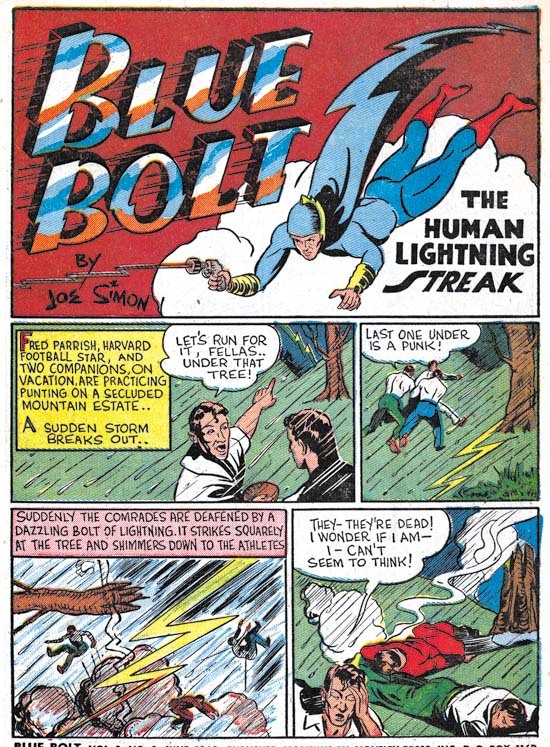 The last Simon and Kirby Blue Bolt, issue #10, came out in March, the same month as the first Captain America. 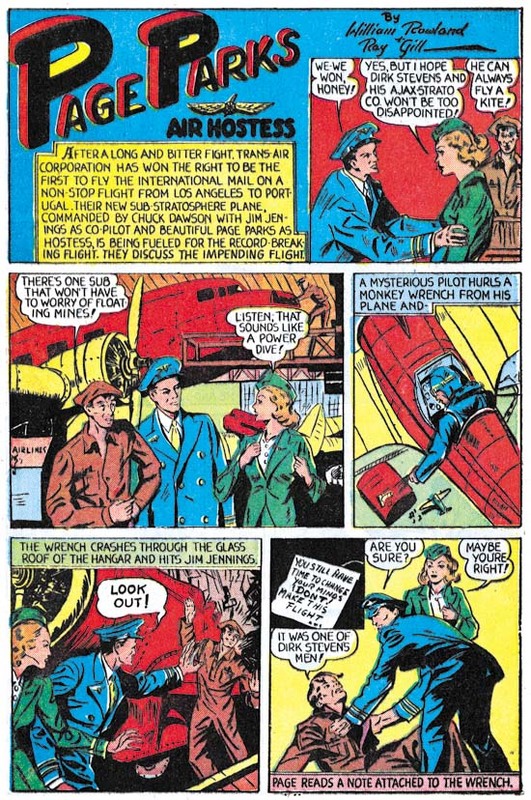 But S&K could not have known about how successful Captain America would be when then stopped working on Blue Bolt. Rather I suspect that Joe and Jack were just getting better page rates at that time. 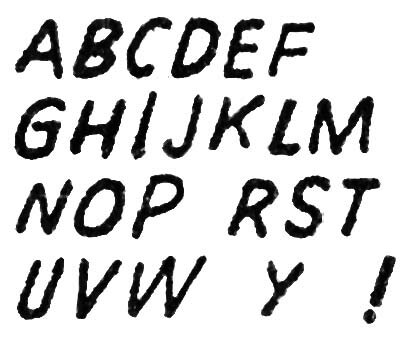 Since Blue Bolt was still being handled by Funnies Inc. that shop would get their cut, leaving a lower page rate for S&K. 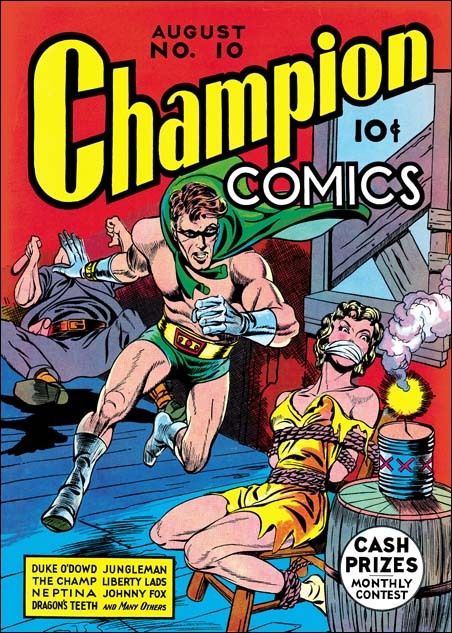 While at Fox Jack and Joe also collaborated on some covers for Champion Comics. Joe had previously done the cover for Champion #8. 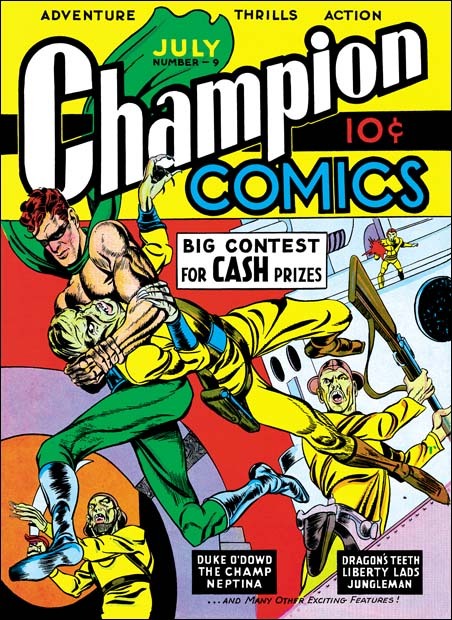 The cover for Champion #9 along with Blue Bolt #2 were the first Simon and Kirby joint efforts (cover dated August 1940). 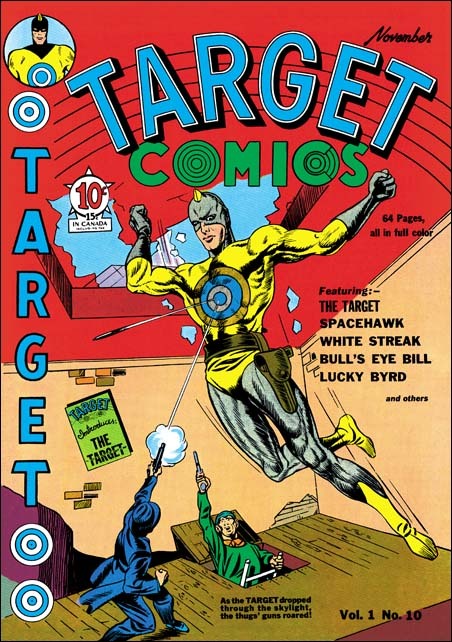 Champion #9 was also Jack’s first comic book cover. It was a good start, Jack’s depiction was already rather unique for the time. 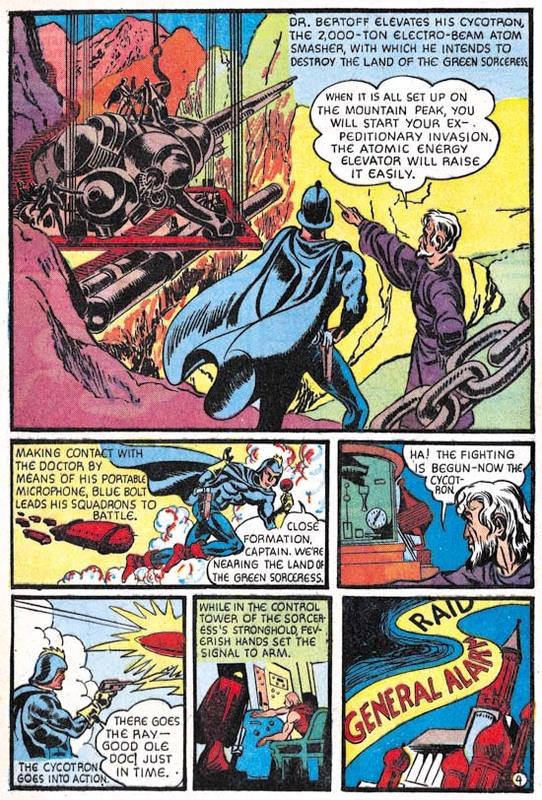 Still you can still see some of Joe Simon’s touch in the face of the hero. 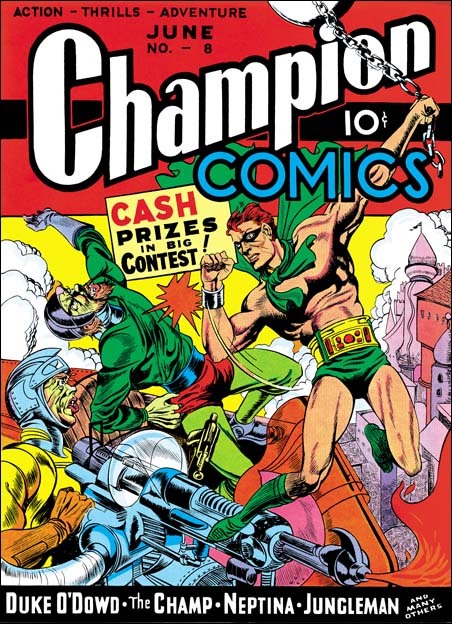 With the cover for Champion #10 we get all Kirby. Lots of action and exaggerated perspective. Posted November 5, 2006 in 2 Fox, 2006/11, Featured Work, Periods, Topic, z Archive. 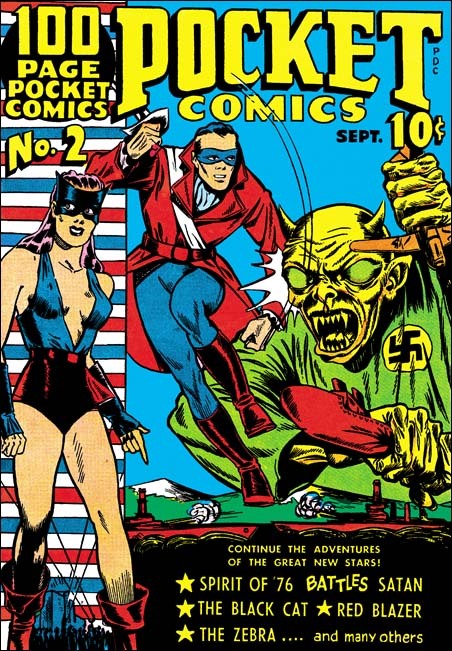 What makes a great comic book cover? Well many will say you need an artist capable of drawing realistic figures. Others desire intricate details and finely rendered lines. All that is well and good but for me what is needed more then anything else is a great story teller. You need someone like Joe Simon. 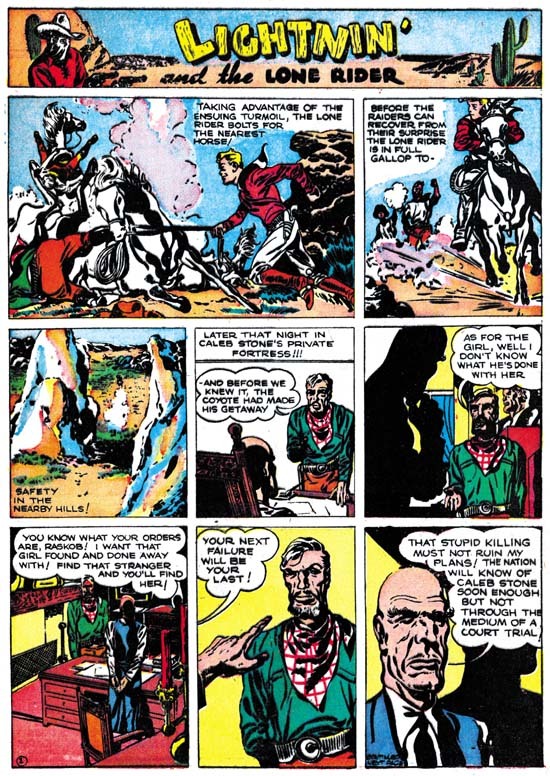 As editor for Fox Comics Joe drew sixteen covers. 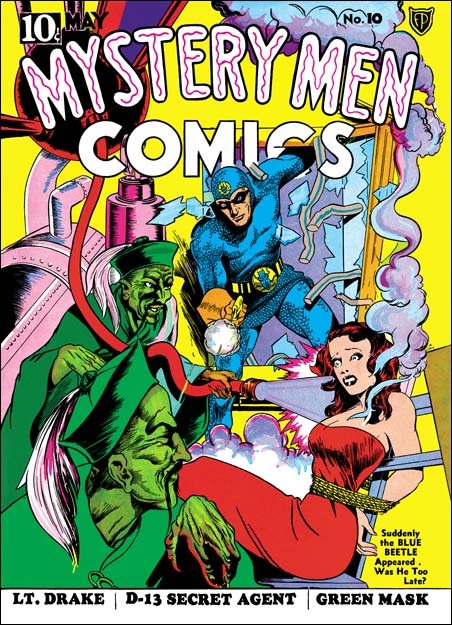 Not a lot of covers but in my opinion if Joe had left comics then, never partnered with Jack Kirby, those sixteen covers alone would have entered him into the select group of the greatest golden age artists. 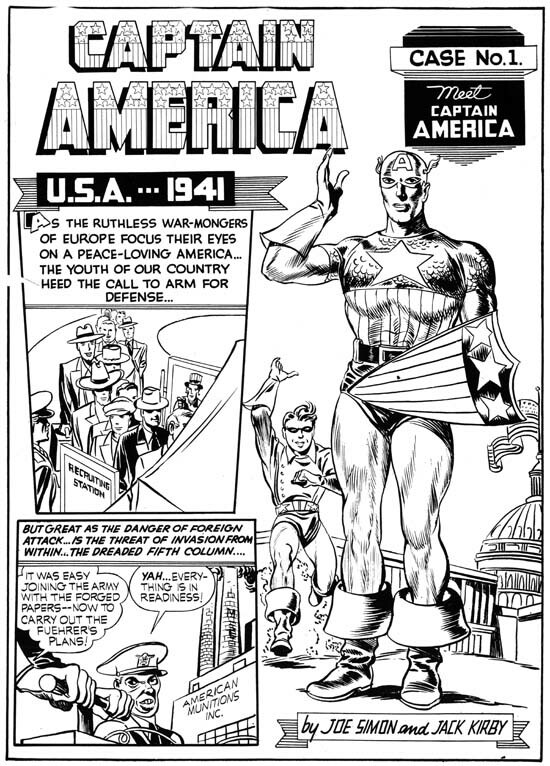 As can be seen in the cover I am featuring for this post, Joe’s anatomy was often inaccurate. The Flame’s rib cage is much too short. Joe also had problems with form. The woman’s right bosom appears rather ample. That makes it surprising to find that even with the dress torn her left breast appears rather flat. A woman’s hair is also very important, at least for a comic cover from the 40’s. But Simon has problems in presenting curls and flowing hair. If that was all Joe had going for him this cover would have been a failure. That is what the blurb in the lower left corner tells us. But who needs the blurb, the picture tells us all that and more. 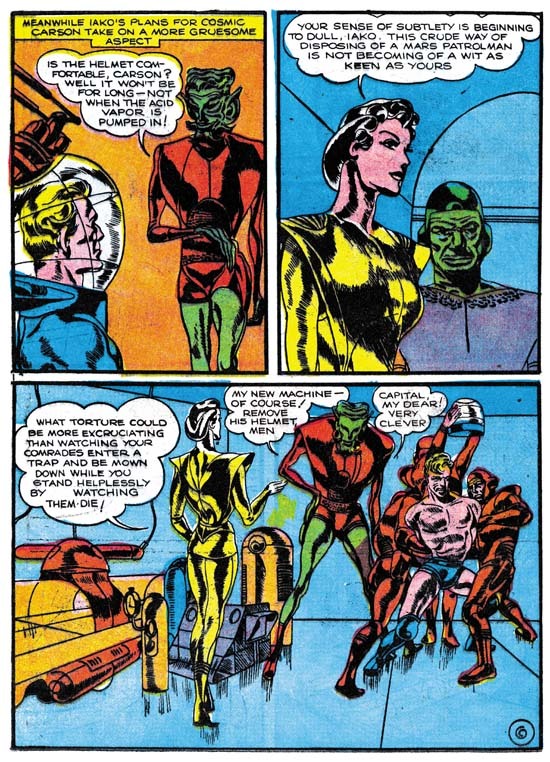 Because it is red, the villain’s clothing might not seem to belong in a laboratory. But look at the pair of scissors (or forceps?) in a pocket clearly designed for them. Obviously this is some sort of medical scientist. Mind you this is not a mild manner researcher. His gaze is intent on the woman. With one hand he reaches for her while with the other he swings a weapon. 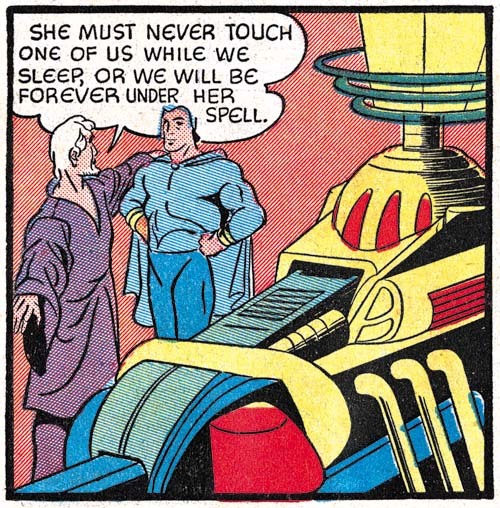 She maybe conscious at this moment but he intends that she will not be for long. And what a weapon our mad scientist has, a skull that he swings with (can that really be?) the former victim’s own hair (I bet you did not know that the hair is the last thing to detach from a decaying skull?). A skeptic might question what use would the scientist have for a beautiful woman. However anyone raising such an issue obviously is unaware that attractive young women have a long history of providing the essential ingredient for many nefarious elixirs. Hey, the eye of a newt may have been good enough for for a witch of yesteryear, but not for a modern scientific antagonist. Things would look bleak for our damsel in distress if not for the sudden appearance of the hero. 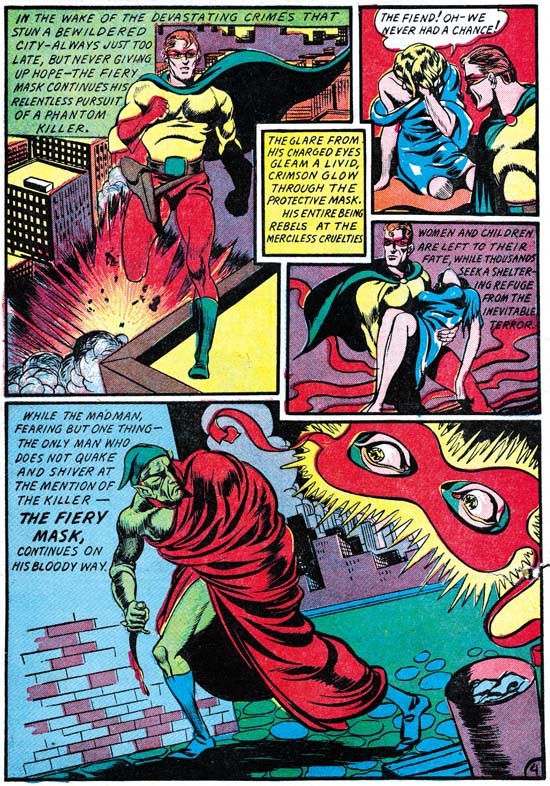 Even if you are not familiar with the Flame, you can feel assured that whatever the hero has shot at his foe’s forehead has got to be effective. Once again the Flame has saved the day. 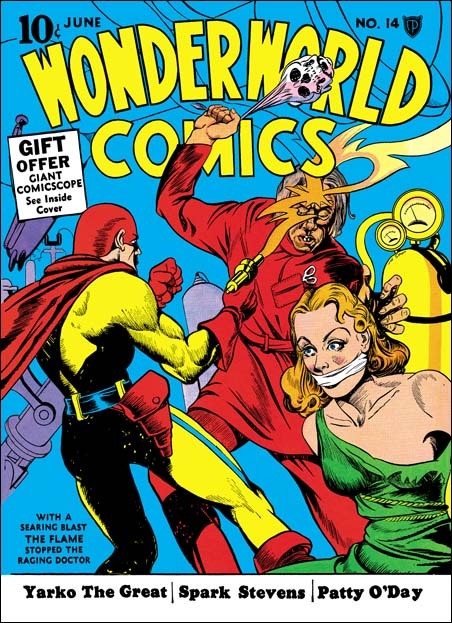 Rescuing a woman from a mad scientist was a common subject for Simon Fox covers. 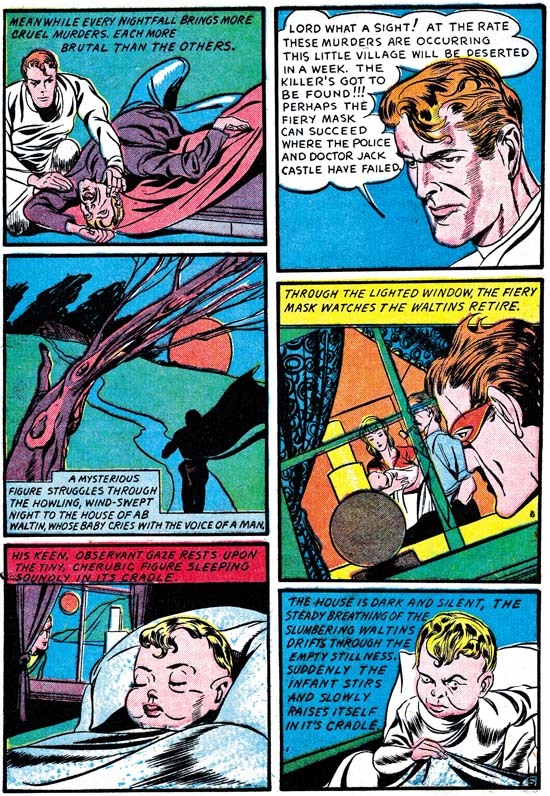 I have previously posted Fantastic #7 and Wonderworld #13. For WC #14 Joe has whittled the theme down to its bare essentials. The background is nothing more then a blue field. We are only provided with a few pieces of scientific apparatus to indicate that the action is taking place in a laboratory. Most of the objects have been given shades of purple. Therefore the apparatus blends with the blue background so as not to distract from the figures done largely in red, yellow and green. The only exception is the gas canister on the right which balances off nicely with the yellow of the Flame’s uniform on the left. 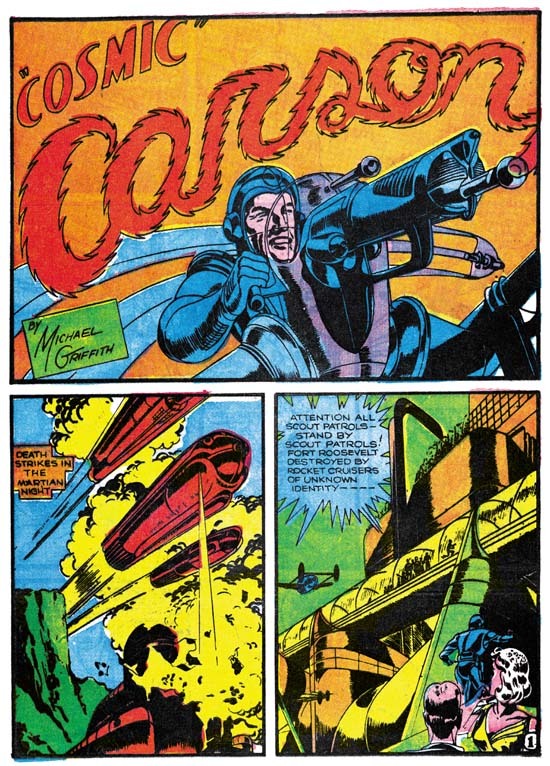 Above, under the comics title are just the outline drawing of the gun’s flame and more equipment. This was really a smart compromise. If fully colored the upper drawing would have distracted from the title. However if the lines had been eliminated the top would have been much too plain. 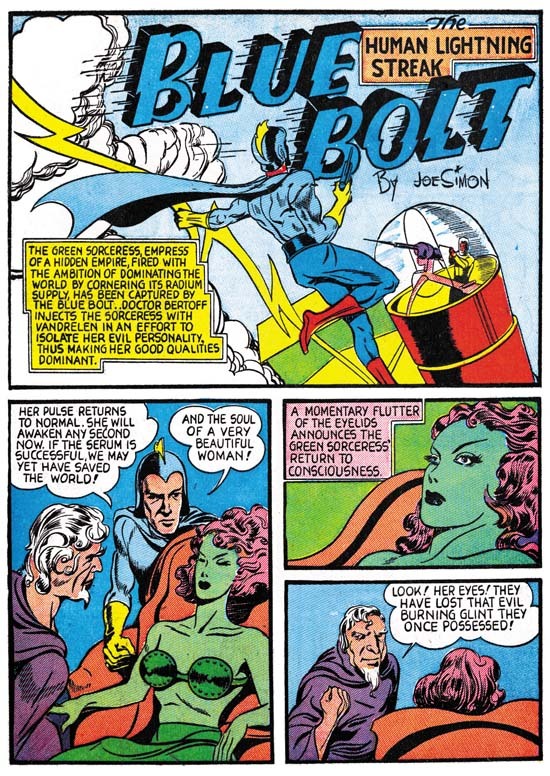 Joe may or man not have done the color guide, but if he did not as editor he likely have provided guidance. In any case the total design is well done. I do not know much about the origin of the Flame. But the story inside shows him appearing out of fire such as from a criminal’s match. 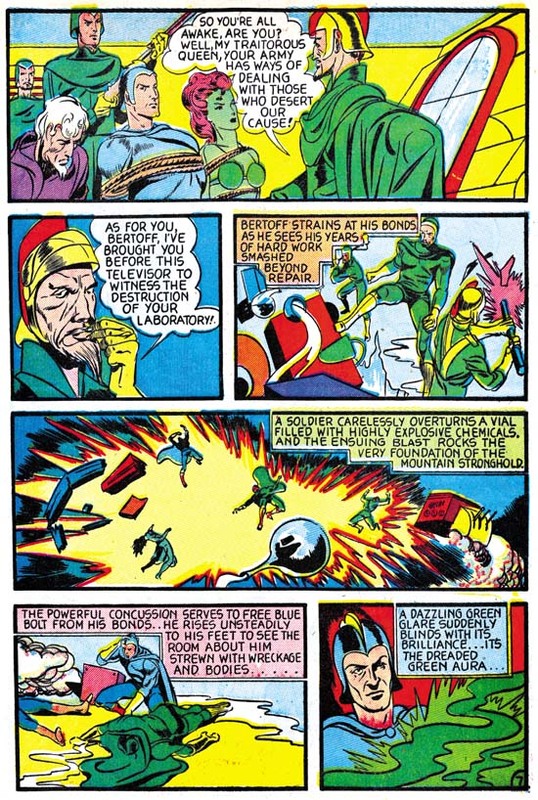 In a few months Simon and Kirby would create a character call the Vision for Timely. The Vision would appear out of smoke. What a surprising coincidence!